Back in May this year, Montane mountaineer Jon Gupta guided Mollie Hughes into the record books. 26-year-old Mollie became the youngest woman in the world to successfully scale Mt Everest from both the north and south sides, having already summited from the south side in 2012. Not only did this propel Mollie into the public spotlight, but it also meant that Jon became the youngest British male to successfully summit Everest from both sides, having previously ascended the mountain in 2013 from the south. In between planning a plethora of projects for himself this year and running a full schedule with his guiding company (Mountain Expeditions), Jon takes time out to discuss this Everest expedition from his perspective. A few months previously Mollie Hughes had contacted me about returning to Everest’s north side to attempt her 'youngest female in the world to climb both sides’ record and whether I could take her. At the time, I had already agreed on my own south side attempt with the team and although a little disappointed not to be heading north, I offered her my advice on the various guides who run expeditions from the Tibetan side. When my south side trip fell apart I picked up the phone and rang Mollie – she was making a shortlist of north side guiding companies but thankfully she hadn't paid a deposit to anyone yet. She seemed over the moon that we could go together and I was equally psyched about it! I have known Mollie for many years now and we have climbed together quite a lot. Spending quality time getting to know my clients in the mountains is really important for me and over the past few years we have climbed in Scotland in the winter and in the Himalayas on Ama Dablam. We spoke often in the build up to our Everest expedition and I knew she was training harder than ever – a sign that she was taking it seriously and really wanted to make this happen. Since I already have a high level of fitness from my work as a mountain guide combined with an active lifestyle, I found that simply upping my cardio training was sufficient. As an expedition leader taking a small scale expedition to Everest there are a huge amount of things to consider. All the hard work is done before you leave the UK. I chatted extensively in detail to my agency in Kathmandu about all the finer details and agreed on everything, right down to the number of tents, bottles of oxygen, gas canisters, weight allowance on the yaks up to advanced basecamp etc. On all the expeditions I run I hate 'extras', so I try to include everything from the start. 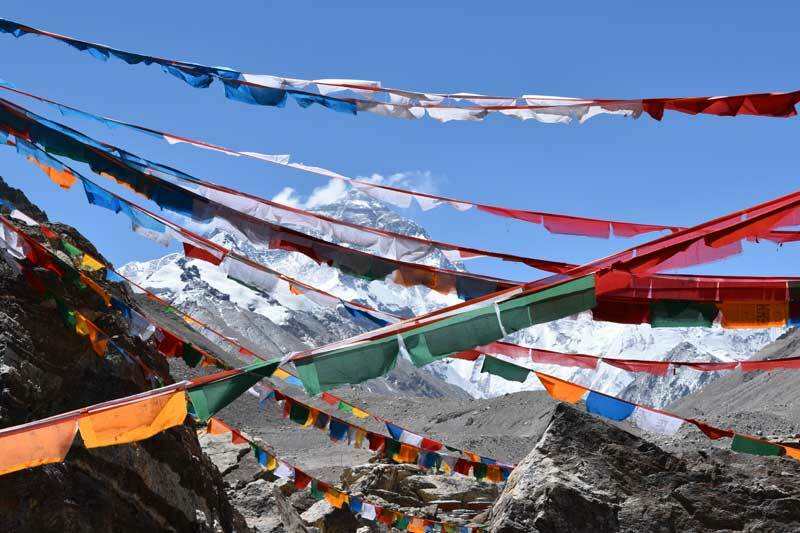 Everest was no exception – I wanted to think of everything before we arrived. Toilet roll, Snickers, wet wipes, toothpaste, suncrea - all pre-planned carefully and taken in with us. Recognising the signs and symptoms of high altitude sickness and not ignoring them. Once I had these first three things covered I could relax about the trip and worry more about how many fudge bars were left or how fast I could complete my Rubik’s Cube. As a result of extensive planning, the problems Mollie and I encountered were almost always logistical and out of our control. China is a very strict part of the world and there were tourist guides, check points and paperwork everywhere. But once on the mountain, everything was perfect and we operated extremely well as a team of four - myself, Mollie and two Sherpas Lhakpa and Lila. Because we were a small expedition, we hired the Basecamp services of another local company and there were eight of us in total (not including the Sherpas or Tibetans). At first this was fun and everyone assumed we were just visiting basecamp because we were young. But as they soon realised that we knew how to look after ourselves the tables turned and they started asking for assistance when not feeling well or with advice about what they should do. Since my main priority was Mollie, I had to gently remind them of this. Of course I would have helped if the issue was serious or they genuinely needed some advice, but not hourly pestering on the basics. My take is - if you don't have the experience at Everest to make your own decisions then buy into a guide service or don't go at all. However, the major element that caused other guides and I sleepless nights was the weather forecasting. Many companies (myself included) bought into expensive weather forecasting specifically for Everest. But none of them matched up which made planning and decision making for the upper mountain incredibly challenging. I compared four of these paid forecasts and made the best decisions I could based on these. Most of the trip went really smoothly and having a client who can manage themselves very well on Everest means I had more time to enjoy the actual experience and relish the feeling of being on Everest again – it’s a really special place! The strength and kindness of Lhakpa, Lila and our basecamp crew was so refreshing and welcoming. Being surrounded by these amazing people had a huge influence on our expedition. The views on the north of Everest are amazing and I remember asking the driver to pull over on the way in just so I could sit and stare at the mountain for a while! There are so many incredible moments from this trip that I could write an entire article just on them! A few include watching the jet stream blast off the top of the mountain, sunrise from Camp 1 at 7,100m after a storm had blown through the night, reaching 7,500m and being only two of seven people on the mountain that day...and obviously reaching the summit was very very special. "During down time there was plenty to do. We played cards with many other people, drank lots of tea and spent time in the kitchen tent chatting to our cooks and tea boys. Basecamp and advanced basecamp were very social so I chatted to other guides and clients. To occupy ourselves on the mountain Mollie and I chatted a lot, I played with my Rubik’s Cube (I was trying to get it down to under 2 minutes!) and we listened to music often. Being in a small tent is fun...you spend a huge amount of time melting snow too! I made videos showing where we were from time to time to put up on social media and one had Britney Spears playing in the background...which went down well! Taking time out to rest and snooze is also really important to let your body relax and recover. The four of us left high camp around 19:30 on 15th May hoping to take around 8-9 hours to reach the summit. As we left I reflected back on everything we had done in the past days, weeks, months leading up to this day. I thought about all the phenomenal work Lila and Lhakpa had put in during the past four weeks in establishing our high camps and pushing the oxygen high on the mountain. The night was calm and still and it felt right. There were around 30 people on the mountain on our summit night and we were all well spread out with the four of us pretty near the front. We moved steadily, not stopping too often, but enough to take on fluids and nibble some food. The north ridge has distinct features: the exit cracks, mushroom rocks, 1st, 2nd and 3rd steps, snow fields, summit ridge. As we pulled over the 3rd step I knew it was about an hour or so from here and the very first signs of sunrise were beginning – everything still felt right. Lhakpa changed over Mollie’s oxygen cylinder and we all drank some tea. I was feeling really strong and took the chance to check in on Lila and Lhakpa too. Lhakpa seemed in fine form and very strong and Lila looked a little tired but all good. With masks off I had a chat with Mollie and she was doing incredibly well, but understandably quite tired. At these altitudes the best way of describing it is that everything seems to slow down a lot, your movement, thought processes and decision making all slow down but the world keeps moving at the same speed. The sun comes up, the weather changes, a dropped water bottle falls at normal speed. It's a strange world to be in, but if you are feeling mentally and physically strong it's a really special one. After the final steep rocky band we turned a corner and came onto the snowy summit ridge. We saw it - the summit! During the entire morning I hadn't doubted we would make it and had micromanaged every situation we came across to keep everything moving and everyone’s energy levels topped up. Lila and Lhakpa were both with Mollie so I took the final 100m at my speed and arrived 5 minutes before them. I took my bag and oxygen mask off and clipped them into a piece of rope just below the summit, put my goggles on my forehead, pulled my hood up and took the final steps on the top of the world with a huge sigh of relief. It was totally and utterly perfect. The early morning light was beautiful but the wind was bitter. Mollie, Lhakpa and Lila soon arrived and we celebrated together on the top. I thanked them for their efforts so far and reminded them that the work now begins! The descent was long and temperatures soon warmed up so we all enjoyed that. The descent was incredible, as we got to see the route we had climbed through the night – just amazing, what a route! A lot of things can happen during the descent and I knew how important it was to keep on top of things. Adrenaline will help a lot on the way up but you don't have this on the way down. This alongside dehydration, exhaustion, delayed onset of high altitude sickness can make descent very dangerous. We took our time, stopping often to drink, eat and manage any tricky steeper sections, eventually arriving back into high camp at 8,300m. Here we had an hour sleep and drank lots of water before continuing down to the lower camp 2 at 7,500m for the night. The predicted strong winds arrived later than expected during the night at camp 2 which made for a pretty blowy descent the following morning! Over the next few days Lila and Lhkapa continued their hard work, helping us to remove all of our expedition kit from the mountain and move it back to basecamp at 5,100m. Immediately after arriving back into Kathmandu I went to Indonesia for a week to relax and warm up my bones. After sleeping in a tent for nearly five weeks it felt incredible to be in a bed or lying on a beach in the sunshine!